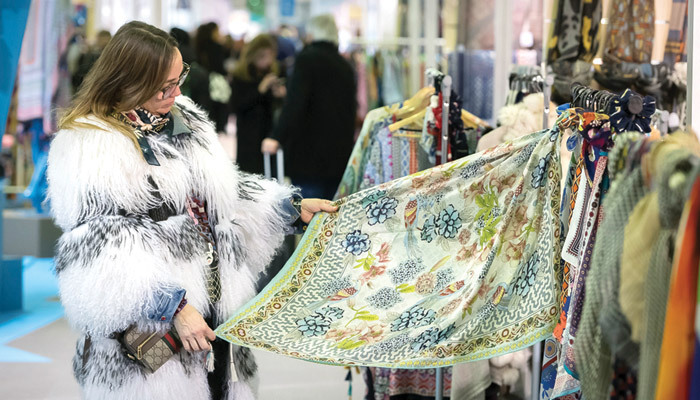 The 44th session of Texworld Paris, where 696 exhibitors from 20 countries had assembled, was without a doubt under the twin signs of energy and sustainable development. Energy because an industrious atmosphere prevailed from the very start of the show. Prime contractors expressed their determination to find the best solution for their projects fast. Very confident, they compared their ideas with what was offered at the trade show in order to assure themselves of the best deals. This design work ahead of the show, more noticeable than before, then left them enough free time to make new discoveries. Close monitoring of markets is one of the strong points of the Messe Frankfurt France trade fairs. Texworld Paris unquestionably benefits from this advantage. Back in 2009, we set up a series of special events to promote environmentally friendly materials and provide exposure for sustainable development. 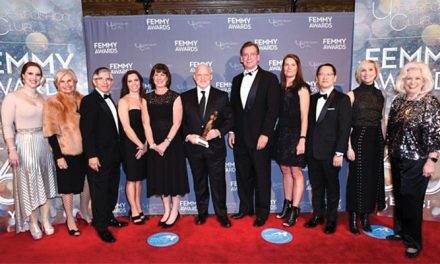 We belong to a global group that originated in Germany, a country that very much values sustainable development. As a pioneer 10 years ago, we felt that this idea was about to ask fundamental questions of the world. We were one of the first to take the plunge. So we set up a circuit and forums dedicated specifically to this idea for growth. I am delighted with the very keen interest demonstrated this session,” stresses Michael Scherpe, President of Messe Frankfurt France. Environmentally friendly materials in the spotlight, “This session was marked by the public’s growing interest in sustainable and responsible production,” resumes Alice Wong, from the Chinese printing firm Chicley. Demand concentrated on several areas: Natural materials, environmentally correct processes, obtaining certification, and the concept of recycling fibres, which was fairly new to visitors. “Some customers only come to look for firms whose innovative production respects the environment, for recycled or for organic products,” explains Aditya Sawant, who was managing the stand at Nahar Industrial Enterprises, a large Indian textiles group. Those searching for these types of products found the Sustainable Development circuit a great help, as it showcased exhibitors that observe the criteria for sustainable materials, environmentally friendly processes or transparent social standards. 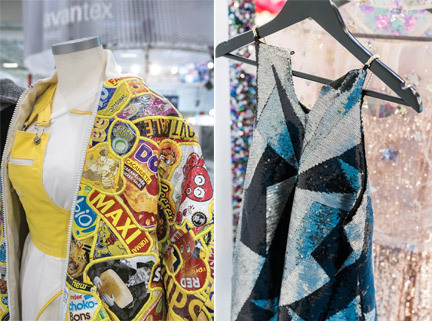 In parallel with this trend, and still very much in keeping with the Avantex Paris show, fabrics or manufacturing methods that incorporated innovation attracted visitors’ attention. 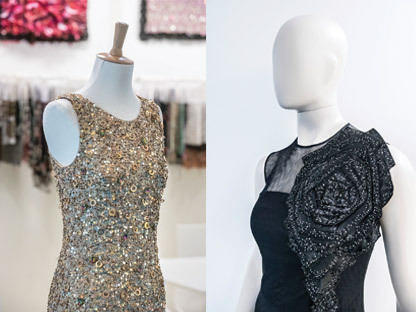 “Our textiles, cut using 3D laser cutting, were among our bestsellers this seaso,” says Hussain Al Beer, Manager for premium materials at the Dubai firm Yaser & Mayasa. He also confirmed the healthy business and particular place as an international platform that Texworld Paris offers, “The exhibition is excellent and very international. Elsewhere it is more difficult to establish contacts as we have at this Texworld show.” The Ethiopian firm Arba Minch textile attended the exhibition for the first time and their Assistant Director was delighted to have made British, Italian and even Turkish contacts. For some exhibitors, the excellent opportunities to meet people are also due to the fact that entrance to the exhibition is free (upon presentation of professional credentials), as that makes access much easier. The attraction and the sense of ease induced by the backdrop – much admired this season – also appeared to play a role: “The surroundings are attractive, comfortable, upbeat, and that has a positive impact on client/vendor relations,” explains Osman, the owner of the Turkish knitwear company ROF Tekstil. 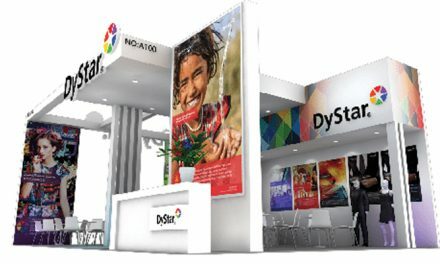 The overall level of satisfaction with the show demonstrates what an excellent place it is, not only for meeting regular customers but also for making new contacts, for the most part international ones. When it came to the Indian hand embroidery firm Ankita Exports, a regular exhibitor at Texworld Paris from the very start, it was obvious: “We have come to see our clientèle who are regular visitors here. What also interests us is the range of nationalities and the different brands. As a company for hand embroidery, one might categorise us under evening and cocktail wear or bridal wear, but ready-to-wear brands at the forefront of fashion aren’t lagging behind and approached us to collaborate on finishes for clothing that will stand out.” It was one of the overriding reasons for creating the all-new Artisan circuit, which passes between Texworld Paris, Apparel Sourcing Paris and Leather world Paris, and which this year showcased manual craftsmanship. At Texworld Paris, it covered, in particular, some Indian embroiderers, definitely not to be missed! Summing up, “Just attending increases the number of customers,” says Jack Lee, Assistant Director at Dong-A.T.O.L., a Korean specialist for functional textiles. This was a very popular segment, since materials relating to sports and leisure were much in demand. Certain exhibitors had brought along their new products, developed for the army and for protection, in order to demonstrate the breadth of their expertise and possible applications for fashion. ELITE, the segment for businesses that offer their customers a wide range of ancillary services, recorded the same levels of satisfaction, both in terms of business transactions and contacts established. 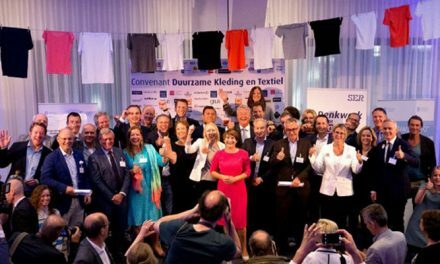 “The great diversity of exhibitors and the size of the show gave rise to a variety of creative propositions,” explains Oscar, Manager at the stand of the Dutch trading company and specialist for linen Northern Linen. “I have to stress that the summer season is essential for exhibitors of lightweight fabrics such as linen.” Kevin Hsueh from the Taiwanese weaving mill Artex Textiles expressed his satisfaction, “We noticed an increase in visitors compared with the previous summer show. This resulted in a rise in successful closure of business contacts. Europe has seen an increase in visitors of almost 2 per cent. This session confirmed the interest shown by French firms in the Messe Frankfurt France trade shows, with a second rise, up 7 per cent again as in February 2018. A significant number of returning Spanish visitors have overtaken the United Kingdom (Brexit) and Turkey (Turkish lira). As for Italy, while remaining very stable, it has posted the strongest growth in this category, up by almost 12 per cent. We note significant attendance by the Netherlands (up 11 per cent). A good showing from Eastern Europe with Poland (up 5 per cent), Belarus (+14 per cent), and Bulgaria (+10 per cent). Ireland and Greece have also made the most of the opportunity (up 7 per cent at 8 per cent respectively). Portugal stands out with an increase of 44 per cent, which attests to the rise in this country’s capacity in clothing production. There are some pleasant surprises in store: • A rise in visitor numbers has also been seen from the top five countries on the American continent (Brazil, USA, Colombia and Mexico). Note the good showing for Brazil (up 22 per cent). The USA has a remained a faithful attendee at the shows, as confirmed by the excellent results (up 20 per cent) since February 2017. Attendance by visitors from Colombia (up 9 per cent) and Canada (up 6 per cent) has grown stronger. • As for Asia, it has also demonstrated fine overall growth in attendance of 14 per cent, and in particular as regards India (up 13 per cent), South Korea (up 6 per cent) and Israel (up 4 per cent). Special mention goes to Japanese visitors (up 30 per cent), whose attendance declined after the tragic events of 2016 and who are now returning to the shows at Le Bourget. Lastly, we see conspicuously strong growth in the numbers of Chinese buyers. This time around, the calendar was more favourable for them.